Nothing much to report. 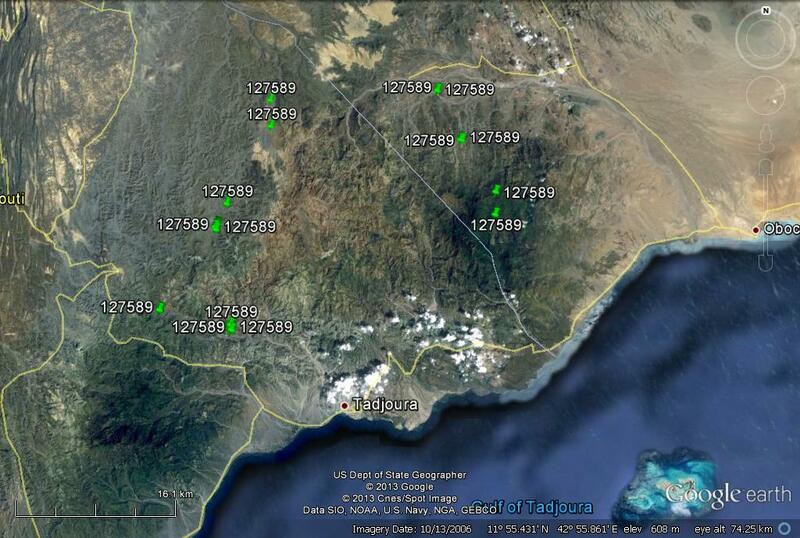 Assamo keeps moving around north of the town of Tadjoura, where we caught her/him. He seems to keep his distance. Locations are 15 - 60 km distant from the town. Tadjoura has a daily abbatoir, which attracts vultures. When we were there we saw 20 - 60 vultures of various ages. It seems curious that Assamo has not returned to the site, despite it having a predictable and plentiful source of food. It seems almost certain that Assamo is not a breeding bird. At least not in this year. In past blog posts I have mentioned how most of these locations are near small settlements (use the kml, available in the last post to see for yourself). Just remember that the Google Earth satellite imagery is from 2006, so just because we don't see a settlement on Google Earth, does not mean there is not one today. Assamo's movements during 19 -28 April 2013 (double click on map to enlarge in a new window).